Holidays are a time to spend with family and friends and to reflect on all the good things we have in life. Unfortunately, they are also prime time for criminals to wreak havoc on motor carrier lots. 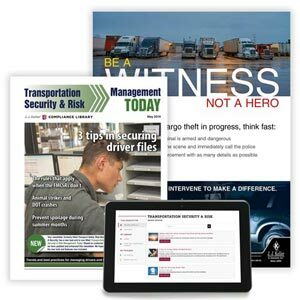 Studies show that cargo theft is greatest during holidays, typically when facilities are closed more days and are less bustling than at other times during the year. Have a policy that prohibits taking loaded trailers home or dropping them at unsecured locations when off duty.